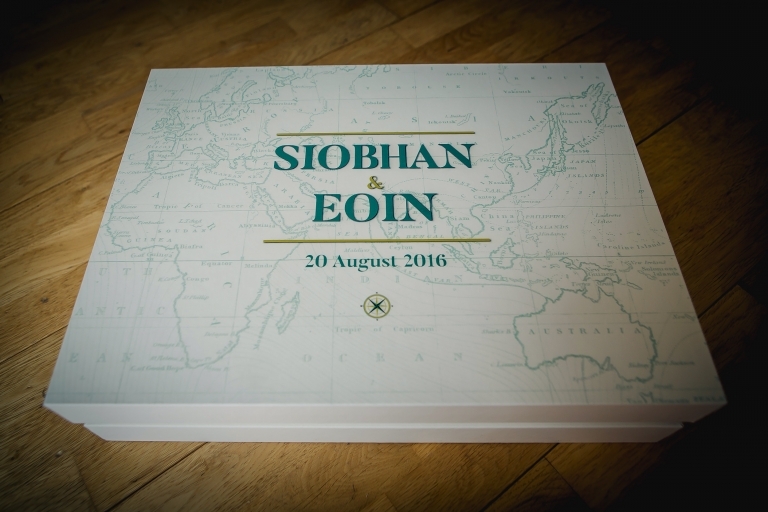 For their album, the guys opted for one of Graphistudio’s “Original Wedding Books” with 60 pages and chose the greenish blue cloud leather cover with the die cut picture insert. 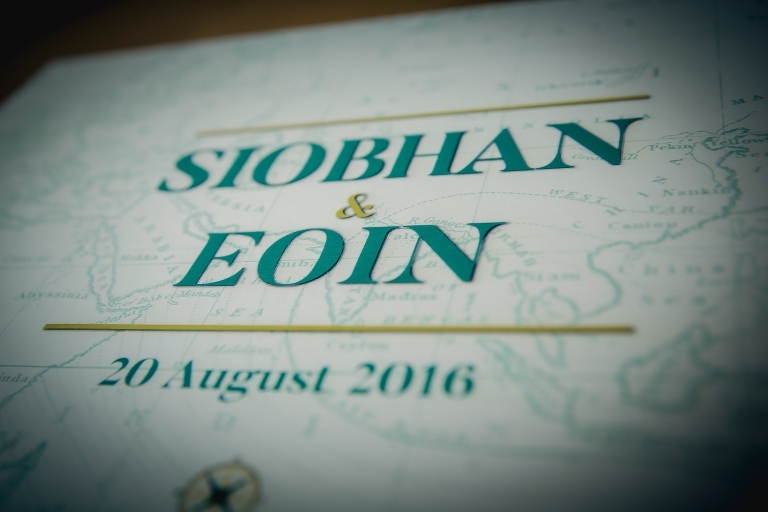 For the design box, we took advantage of the aforementioned “enoblement” programme, and recreated the design used on the table names and other “bits & bobs”, that had all been created by Siobhan’s sister, Roisin. 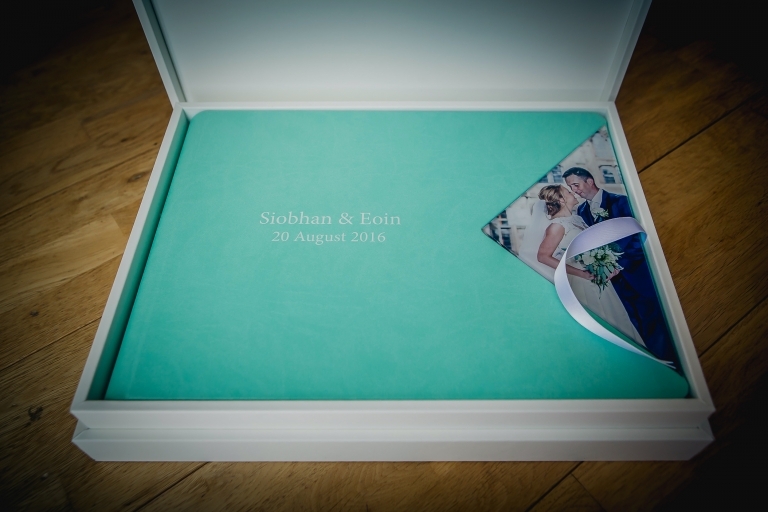 This all makes your album totally unique and carries on the theme and style of your wedding day :-)…how fabulous! I’m a big big fan of wedding albums and I absolutely love to see your wedding pictures displayed in this way :-)…much better than on a computer screen in my opinion. Of course, I’m biased, but I do believe that I’m partnered with the best album company in the world, Graphistudio from Italy, used by the majority of top professional wedding photographers worldwide. Check these out…there’s so many ways in which the album can be customised in terms of covers, back & spines, boxes, colours etc, that apparently there are about 4 million different combinations in total! Graphistudio also have a policy of “vetting” photographers that they wish to be partnered with, so you can be assured that you’re getting an album that just isn’t available to a large majority…how unique is that! Anyway, here’s a few images of the actual album, along with the proof design for all of the pages. I love shooting weddings but I do often get booked up around 18-24 months in advance, so if you’re keen to book with me, or just need more information, please do get in touch. My wedding collections start at £1195.